ISLAMABAD, Sep 10 (APP): Prime Minister Muhammad Nawaz Sharif Saturday said that the ultimate aim of the government’s endeavours in energy, economy and infrastructure sectors was uplift of the living standard of the common man. 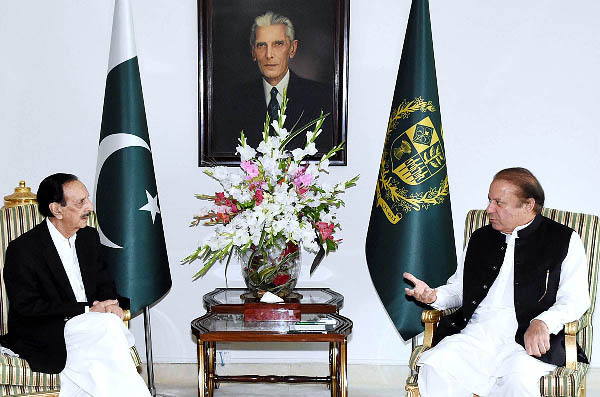 In a meeting with Leader of the House in Senate Raja Zafar ul Haq who called on him at the PM House, the prime minister said the government was making all out efforts to resolve power and gas shortage in the country. He said the government had invested billions of rupees in the energy sector and through completion of the ongoing energy projects, it would not only eliminate load shedding but would also be able to provide cheap electricity to consumers. The prime minister hoped that the completion of China-Pakistan Economic Corridor (CPEC) would not only prove to be a game changer for the country but also a fate changer for the whole region. The country’s law and order situation had significantly improved and its impact was already being realised by the business community both domestically and internationally, he added. Prime Minister Sharif said the confidence of the international financial markets in Pakistan’s positive economic outlook was a proof of successful march towards attaining long term economic stability. “Increase in tax revenue through tax administration; increase in foreign exchange reserves well over $20 billion; resolution of energy issues including electricity tariff rationalization and reforms in the gas sector have significantly contributed towards economic stability in the country,” the prime minister remarked. He said the government was pursuing its development agenda simultaneously for creation of economic activities and generation of employment opportunities leading to reduction in poverty. The Leader of House appreciated the visionary leadership of the prime minister and said that his agenda of development and prosperity would steer the country out of the problems that are being faced today.